Since its founding in 1903, Scripps Institution of Oceanography at the University of California, San Diego has been a leader in ocean exploration for the benefit of science and society. In support of its broad sea going expeditions, Scripps' participation and support of the maritime industry has spanned from the local to national to international levels. When Sean Barr of the Canadian Consulate in San Diego introduced Michael Jones, president of The Maritime Alliance and its sister organization The Security Network to Andrew Walls of the British Columbia Innovation Council (BCIC), creative sparks began to fly. All present realized that this would indeed be a mutually beneficial partnership. After all, the three organizations were alike in their nature and charged with the development of technology-based economic growth through partnerships and collaboration. They also shared the common view that the innovation existing in high-technology SMEs (small and medium enterprises) represented a mountain of unrealized operational and economic opportunity -- for which they collectively held both the ability and responsibility to unleash. Looking at boosting your bottom line by making new sales abroad? The U.S. Commercial Service's global network of trade professionals is located in offices across the United States and in American Embassies and Consulates in nearly 80 countries, and works to connect U.S. companies with international buyers. The Maritime Alliance recently discussed international opportunities for U.S. maritime companies with Julia Rauner Guerrero, international trade specialist with the U.S. Commercial Service in San Diego, Calif. The San Diego Unified Port District (often referred to as the Port) was created by the state Legislature in 1962 to manage San Diego Bay and surrounding tidelands. The Port is made up of Imperial Beach, National City, Chula Vista, San Diego and Coronado waterfront properties. While protecting the Tidelands Trust resources, the Port balances economic benefits, community services, environmental stewardship and public safety on behalf of the citizens of California. The Maritime Alliance sat down with John MacIntyre, homeland security manager of the Port of San Diego to hear his thoughts on the maritime technology community and gain insight on the Port's unique place in it. The Maritime Alliance recently sat down with Don Rodocker, president of SeaBotix, to garner his perspective on the maritime community in San Diego in advance of the upcoming Maritime Collaboration Summit. For more than 40 years, San Diego Regional Economic Development Corp. (EDC) has provided leadership by implementing strategies that set the San Diego region apart as a thriving center of technology and entrepreneurship built upon information networks, a knowledge-based economy, a culture of innovation and unparalleled lifestyle. The Maritime Alliance spoke with Julie Meier Wright, CEO and president of the EDC, to get her thoughts on the maritime technology sector in San Diego. The Maritime Alliance recently sat down with Russ Gibbon, Business Development Manager for the city of San Diego to garner his perspective on the maritime community in San Diego in advance of the upcoming Maritime Collaboration Summit. The Ocean Discovery Institute was created 10 years ago to leverage San Diego's natural environments as a means to engage young people from underserved communities and inspire them to become part of the next generation of scientific and environmental leaders. Ray Ashley, Ph.D., is president and CEO of the San Diego Maritime Museum, with one of the finest collections of historic ships in the world. With an M.A. in maritime history and underwater research from East Carolina University, and a Ph.D. in the history of science and technology from Duke University, Ashley is uniquely suited to discuss the important historical relationship between maritime technology innovation and democracy, and to look forward at the maritime opportunity for San Diego. 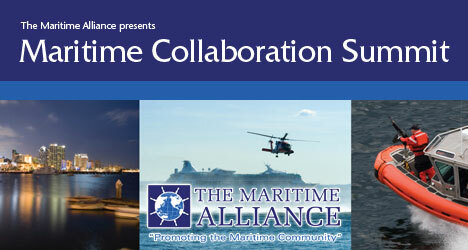 We are very pleased that you have joined us for the first annual Maritime Collaboration Summit & Exposition as part of San Diego Maritime Week, Nov. 14-20. Hopefully you visited the Maritime Science Expo over the Nov. 14-15 weekend, attended the Maritime Gala Dinner on Nov. 16, and will attend Maritime Demo Day on Nov. 19.